The Daily Telegraph reports that air pollution is getting worse in Sydney, with one in ten days rating “poor” in 2009. Critics of the ruling Labor state government claim that increasing air pollution and the lack of public transport are the cause. They are half right. Sydney’s Densification is Intensifying Traffic Congestion: Sydney’s intensifying traffic congestion contributes substantially to rising air pollution. The increasing traffic congestion is an inevitable consequence of the state government’ s “metropolitan strategy” which is “jamming” high rise residential buildings into suburban detached housing neighborhoods. The mathematics of traffic and densification is that unless each additional resident drives minus kilometers and minus hours, there will be more traffic, even before considering the impacts of intensifying commercial and heavy vehicle traffic. The road system was not built for higher densities and neither was other infrastructure such as sewers or the water system, as Tony Recsei has noted in his preface to the 6th Annual Demographia International Housing Survey. The fact is that higher densities are strongly associated with more traffic, which means greater traffic congestion. The additional stop and go traffic produces greater pollution on the roads adjacent to which people and their children live. It also means more greenhouse gas emissions, because fuel consumption increases as traffic congestion intensifies. The association between higher densities and greater traffic congestion is also indicated by the ICLEI-Local Governments for Sustainability Density-VMT Calculator, based upon Sierra Club research. According to the Calculator, under the urban consolidation (“smart growth”) scenario, residential housing would be 37 housing units per hectare, as opposed to its “business as usual” scenario at a density of 10 housing units per hectare. The density of traffic (vehicle kilometers per square kilometer) under the higher density “urban consolidation” strategy would be 2.5 times as high as under the “business as usual” scenario. According to federal Bureau of Transport and Regional Economics, Sydney’s total traffic volume is projected to increase nearly 20% over the next decade. Nearly half of the increase will come from commercial and heavy vehicles. With little or no expansion of the urban footprint, there will be nowhere for the new traffic to go except onto the existing already over-crowded roadways. Stuck in Sydney’s Traffic: Already, the average one-way trip to work in Sydney is longer than in all but one of the 52 metropolitan areas in the United States with more than 1,000,000 population. Only New York takes as long as Sydney, because so many people use public transport, which is inherently slower for nearly all trips. Of Blind Faith: Public Transport: Public transport serves as an article of faith to which officials cling in the innocent or cynical hope that it can reduce traffic congestion. There is no doubt of the good that public transport can do to get people to the central city (CBD), with its highly concentrated employment. However, Sydney’s CBD oriented system is over-crowded. A succession of state governments have been incapable of providing sufficient service to make the trip comfortable for the less than 20% of Sydney employees who work there. Proposals to centralize more of Sydney’s employment in the CBD could not be more wrong-headed. Transit is about the CBD, whether in Sydney, Toronto, Portland or Atlanta. The public transport system capable of attracting a significant number of commuters to the smaller concentrated centers like Chatswood, Parramatta, or Norwest (much less the dispersed employment throughout the rest of the metropolitan area) has never been conceived, much less seriously proposed or built. Why We Regulate Air Pollution: Public health was the very justification for regulating air pollution. Air pollution’s negative impacts are principally local. The consequences are measured reduce the quality of life of people intimately exposed to the more intense air pollution from nearby roads. Higher densities come with a price. Higher densities are producing greater traffic congestion, higher levels of air pollution and greater public health risks. This is just the beginning. 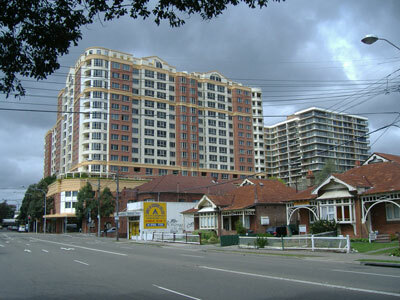 Photograph: Strathfied, Sydney: Densification of detached housing neighborhood.